Nothing defines a summer wedding quite like a blousy, colorful and wildly romantic floral arrangement. Below, 27 gorgeous, summer-ready bouquets that are guaranteed to Pin-spire. 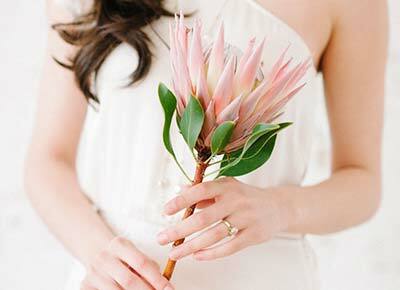 We can’t get over the gorgeousness of this protea, dahlia and delicate branch situation. Three words: Buttercup garden roses. Talk about a photogenic palette. Monochrome blooms + trailing greens = chic. There’s nothing conventional about this quirky, colorful bouquet. How lovely is this dahlia and wild hydrangea pairing? Go ahead, add a starfish or two to the mix. Look to dahlias and caspia to replicate this serene lilac palette. This swoony combo would be perfect for a waterside wedding. Juicy, hot-toned garden roses = stuff of dreams. PSA: Orange ranunculus and fern filler greens make for a total showstopper. The frilly pink astilbe makes us so happy. We love how the boho greens funk up this classic color choice. Bring on the luscious roses and velvety ranunculus. The hypericum berries add such fun texture to the mix. And how about that red-tipped summer hydrangea? Sue us; we love a simple black-eyed Susan. How rad is this neon palette? Pair with purple blooms for a simple and stunning bouquet. Load up on garden roses, anemones and plenty of dramatic greens. The scale here (those peonies!) is just so striking. We love how the sharp greenery contrasts with the round peonies. How very fitting for an early July wedding. Periwinkle sweet peas + indigo thistle = blue bouquet heaven. Pink peonies? Yawn. Pink peonies + funky succulents? Now we're talkin'.